Cooling The Past In The Faroes. Another instance of ‘adjustments’ completely distorting temperature history – from Paul Homewood. 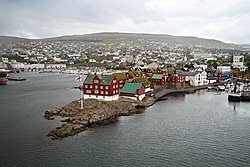 In 2003, two proper scientists wrote a paper on the climate of the Faroe Islands, which lie between Iceland and Norway. They published this graph of air temperatures at the capital Torshavn. So we find confirmation of the 1925-40 warm period, and that the recent temperature rise is no more than a natural recovery from the colder 1950-80 interval. Of course, temperatures may have risen since 2003, but the raw GISS data shows otherwise. Below is their graph based on the raw GHCN V2 temperatures, as they appeared in 2011. (The warmest year was 2003 itself). Now, you can probably guess where we are going here! Trying to make reality disappear can be a job for life if it’s what your employer demands. Roger, a comment about your word order, on Paul’s original posting, is very relevant. The large increase in cosmic rays. Click. It is evident that the temperature of the Gulf Stream, ice extent in the Arctic depend on AMO cycle. You may also note that the decline AMO since 2010 is quite sharp. If we consider the solar minimum, it may be a bad forecast for the winter in Europe. Due to the increase of the GCR for about 10 days can be predicted block of the southern polar vortex. Cooling the past in the US.